I hope that you had a wonderful weekend! Mine was pretty busy and got an early start on Friday. My husband, children, and I had to go back home for a couple of days to see our family. It was so nice to see everyone. We came home Saturday night, and I spent Sunday afternoon cleaning out my pantry. While I know that this is not the most gorgeous topic to blog about, it is still something that I hope you will find useful in your own kitchens. Kitchen organization is so important in running an efficient work area. I want to first apologize for my photography. My walk in pantry is a very tight space making it difficult to take very good pictures. However, I think that you will get the general idea. I purchased several black container baskets to catagorize my pantry items. After sorting alike items, I labeled each basket. This makes it so much easier to find things, and it saves so much time when you are making your grocery list. I used several small baskets for containing smaller items like tea bags, jello boxes, pudding boxes, and ribbons for packaging baked goods to give to loved ones and neighbors. I purchased this storage rack to maximize space. It is specifically designed to hold foil, plastic wrap, wax paper, parchment paper, and freezer bag boxes. On the top shelf of the pantry, I places a small wine rack. The bottom shelf houses my cast iron collection. I love cooking with cast iron, but they are very heavy. Therefore, having a sturdy shelf to store them is perfect. I placed several large baskets on the floor to hold potatoes, onions, and large boxes. On the opposite side, Mr. Bleu placed a large piece of peg board with movable hooks to house my cutting boards, pastry mat, skillets, and aprons. At the back of the pantry there is a recessed area that has extra shelves to store appliances that are rarely used. There is also a spot for my baking cart. I hope that I have shared some useful tips to help you to get your kitchen and pantry organized for the upcoming Fall season. I’m so happy that you stopped by today, and I hope that you have a very blessed and happy Monday!!! Hi Eilis! With my kids it does take some extra clean up in the pantry from time to time-lol. It will look organized for awhile, but after they have ransacked it I have to tidy it back up. The baskets do help though. I hope that you are having a great Monday, and I hope that you have a wonderful week!!! Shannon, this is great! This is a project that I have been putting off for the longest! Hopefully, I can get it done before the holidays. If not, what’s another year? Lol! You did a fabulous job! Thank you Shenita! I hope that you are having a great evening, and I hope that you have a wonderful week!!! Thank you Pam! I hope that you are having a great evening, and I hope that you have a wonderful week! Coming over from the Make it Pretty party. How nice to get your pantry all organized. It looks great! Thank you so much Cecilia! I’m so happy that you stopped by! I hope that you have a wonderful week!!! I love an organized pantry and can get mine looking great and somehow in no time it’s a cluttered mess again! Adore the idea of hanging your cutting board – such a great tip to add the peg board! Happy Tuesday! I know what you mean about having it all neat and organized, and it becoming a cluttered mess again. With kids it is a constant effort! I’m so happy that you stopped by, and I hope that you are having a wonderful day! Hi Karen! The baskets do work great. I even used one for my spices. I don’t know if that is something that would work for you or not. I have seen these graduated shelf units that you can place on a shelf to organize your spices. I think I have seen them at the Container Store. That is where I found my foil/plastic wrap organizer. I’m so happy that you stopped by, and I hope that you are having a wonderful day! Thank you Shirley! I have been thinking of you. I hope that your recovery is going well. Take care, and I hope that you have a wonderful evening! Loving your pantry look! I need to spend a little time and get organized. Maybe once the weather changes and I am stuck inside. Thanks as always for sharing your lovely posts at DI&DI. Thank you Linda, and thank you for allowing me to be a party of your party. I hope that you have a wonderful week! Oh, I love your pantry and your organizational skills! Everything is in its place and at hand! Can you come and live with me for a little while and get me this organized? SIGH! Hi Yvonne! I try to be organized, but sometimes things do tend to get a little messy-lol! I have a few other organization projects that I still need to tackle, but have been putting them off. Hopefully, I will get to them soon. I’m so happy that you stopped by, and I hope that you have a blessed and wonderful Wednesday!!! Great pantry! 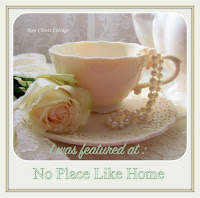 Thanks for sharing at Home Sweet Home! Thank you Sherry! I hope that you have a wonderful day!!! I love, love, love your pantry, and will give anything to have one like this.